Arianne qualified in 2012 from North Highland College, Thurso, and worked in mixed practice before joining us in 2016. 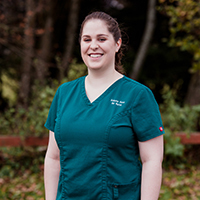 Arianne has a keen interest in wound management and surgical nursing. Outside of work Arianne enjoys getting outside hillwalking and beach-combing.